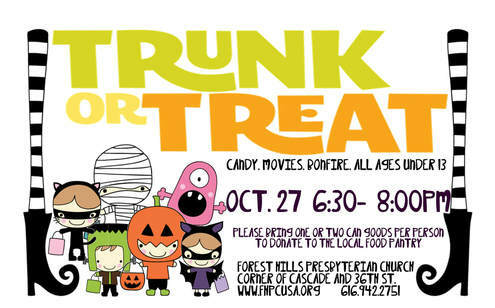 Join us for our annual Trunk or Treat festival (RAIN OR SHINE) at Forest Hills Church! We will have tons of candy, a bonfire (with s'mores! ), cotton candy machine, Halloween movies playing on a large screen, a raffle for gift baskets and even MORE candy! Although this event is free, we ask that each child bring one or two canned goods to donate to our local food pantry in service to others in our community!